This blog post describes best practices for adopting and implementing Amazon Connect, a cloud-based contact center built on AWS, into your enterprise. These best practices have been compiled from previous customer migrations to Amazon Connect. Because most contact centers are technologically and organizationally complex, this post focuses on the best way to get started, plan for, and perform a migration. The guidance in this post can help you maximize the return on your investment while minimizing organizational stress. Teams that manage small or large contact center activity have often spent years developing specialized skills, learning how to attract and retain staff, and learning how to manage the procurement of specialized IT equipment. This equipment is complex, generally proprietary, and often provided by vendor partners who are not customer-focused. It’s typical to spend 80 percent or more of the contact center team’s effort on keeping the contact center infrastructure running well. The other 20 percent focuses on improving the contact center customer’s experience. By adopting Amazon Connect, your goal should be to reverse those percentages. Implementing Amazon Connect can help you realize significant capital and operational savings. It provides you the opportunity to focus away from high availability operations, and instead, focus on nearly continuous innovation around customer experience to drive greater satisfaction. Your AWS solutions architect or an Amazon Connect partner can help you test the Amazon Connect features for a proof of concept. If you have an in-house telephony team, it’s a good idea to involve them in the development of the proof of concept. All that is needed to prepare for POC participation is a few hours of training and experimentation. You can try Amazon Connect using the AWS Free Tier, without charge using the 30 minutes a month of free calling included with the service for little risk or expense. After you replicate your call flow capabilities, you can use the trial period to experiment with the advanced features. For example, you can use the Amazon Lex chatbot, or build self-service features into your caller interaction. 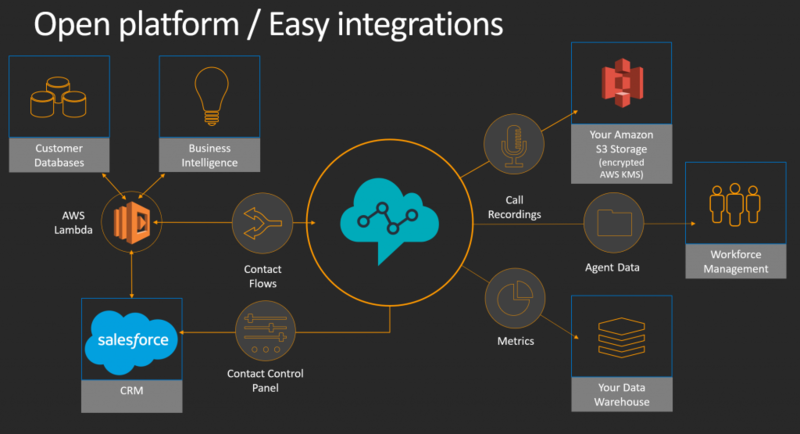 Amazon Connect simplifies the contact center technology stack. It combines the typical complex hardware and software layers of legacy call center systems into a more approachable Web console that is fully integrated and requires no infrastructure management. What’s left are the interactions between customers and agents, and any integrations with third party systems, such as customer relationship management (CRM) or workforce management (WFM) systems. Demonstrate that Amazon Connect can handle the scope of your contact center operations. Then verify that the integrations that you need are available. Afterward, it is a good idea to think through the best way to fully migrate to the service. There are many ways to implement a successful migration. However, this post offers suggestions to make your migration simpler and maximize your return in investment of time and operating expense. To start migrating, review your current vendor support, equipment, database, telephony, and data center contracts with respect to total budget level, renewal dates, and component dependencies. It is also helpful to order your vendor budget from largest to smallest, and thoroughly list contract expiration dates. Consider prioritizing the near-term contract expirations in your migration goal setting. Also, consider shortening any vendor renewals to the minimum reasonable time period as you develop your plan. Your goal should be to minimize the overlapping operation of existing equipment and software and the newly added cost of using Amazon Connect. This is normally referred to as a bubble cost. This cost accrues while you move your contact centers and shut down the legacy operation. There can be multiple simultaneous dependencies to address in this analysis. For example, one telephony component depends on another with a later support renewal date. After you arrive at a migration goal date as part of the analysis, communicate these goals to the team and drive your plan using these dates. An example of the date goal is to move X contact centers by Y date, while vacating the current data center at Y date +30 days. The team may be concerned about their own skills and required training. They may also be concerned about the possibility of job loss, so it is helpful to have a clear set of goal dates that include training time. Clear and well-communicated goals can help motivate your team toward a successful migration. Before migrating, develop a plan for equipment retirement and resale. This effort can take several months to implement and may require specialized assistance. If you are leasing data center space, you may not be able to relinquish the space and stop the related spending until your cabinets or cages are empty and clean. It’s easy to overlook this step and the related dependencies. You also want to retire and resell, or dispose of, your collection of telephone handsets and related desktop gear. Don’t underestimate the change management challenge posed by moving to USB headsets that connect to a PC or laptop, while finding a reasonable disposition for the legacy desktop gear. As part of your Amazon Connect migration, you must port your existing direct inward dial and toll-free numbers to AWS. To continue using your current United States phone number(s) with Amazon Connect, submit a support ticket to port the number(s) to AWS Support. The Amazon Connect team will process your request and assist you with the number porting process. Porting phone numbers typically takes between two to four weeks after you submit the required information. The amount of time depends on the complexity of the request and your current carrier. Porting toll-free numbers, or requests to port a large quantity of numbers at one time, usually take longer than porting local, direct dial numbers. We recommend that you select a new phone number for Amazon Connect so that you can become familiar with the service while waiting for your number to be ported. If you have outbound dialer projects and requirements, consider working on them following completion of your inbound contact center activities. Outbound dialing is possible with Amazon Connect, but currently requires custom API programming or a partner dialer integration depending on the richness of feature set required. For more information about the API programming, see Amazon Connect Automated Outbound Calling is Now Generally Available. For more information about partner dialer integration, see Amazon Connect integrations. Your selection of complementary AWS services will likely be decided by the extent of your interest in data analysis and the use of machine learning process improvement techniques. During the training period, let the team decide whether they want to engage or would rather stay with their proprietary systems skills. With this type of migration, it’s not easy to know which staff members will be most interested in learning new technologies, so it is always best to invest in training for all members of the team. Your AWS account team or an AWS partner can help by providing workshops, design and architecture assistance, and by assigning trained consultants to handle tasks that the team may not be ready to tackle. Hold a hackathon with the team. See who can build a call flow fastest and with the least effort. Make sure that even non-technical managers participate to see how simple the process is. Start small by implementing basic call flows and getting them into production. Train the team on the basic, and then the advanced, Amazon Connect capabilities. Focus on understanding how to use the many types of data that flow from Amazon Connect, starting with contact flow logs. Train the team on using AWS tools for monitoring, reporting and analysis, such as Amazon Connect reporting, and Amazon CloudWatch metrics dashboards. When you begin migrating contact centers or call queues, it is helpful to move away from traditional IT or software development project management approaches that involve a waterfall or a step/gate sequence. Most customers find that switching to a lean management approach, such as agile methods, to increase the speed of execution, learning, and responsiveness to your customers. A project Kanban board can help here. Kanban is a lean management approach that can help minimize the typical team tendency to manage too much work in progress, which is a common cause of migration slowdowns. Agile methods can help your team learn faster as it migrates call queues to Amazon Connect. A learning organization generally increases their team velocity as the conversion progresses. If you adopt agile methods, consider appointing a product owner for the Amazon Connect migration. Give that person the authority to make decisions quickly and with minimal oversight. Some customers chose to migrate their help desk or internal support organization first. This is because of the generally small size of the help desk team, and the fact that the call queue is managed internally. The help desk team can become your champions and can help write FAQs that the cloud team can generalize for next set of transitions. Next, it’s generally best to migrate standalone contact center groups. Ideally, these groups also have minimal or no IVR or automation needs and are not dependent on workflow management software for scheduling. Be mindful of existing inbound call queues that are reliant on each other, such as a call flow where a caller calls one number with a normal transfer to another number. These queues must be moved together. If you have no team members who can write basic AWS Lambda functions, and operate the Amazon Connect controls prior to training, consider hiring an Amazon Connect Partner to start the process and work directly with the team. In general, avoid having the partners do the work for you. Your team must be able to take over at the end of the consulting project and maintain and improve your Amazon Connect contact center over time. It also helps to focus on migrating contact center work that matches the financial priority list that you created in the planning stage. This can help minimize overlapping or bubble costs and project delays, which can obstruct successful migrations. You can use the Connectivity Checker from a typical agent desktop to help identify the optimal Region and amount of latency in your connection. Quality of connectivity to AWS and the Public WAN – Work with your networking team to minimize the number of hops from your network edge to the AWS network. If you have remote agents, make sure that they have stable connections to the public internet. You can implement an AWS Direct Connect circuit from your network to the AWS network. This can improve performance and scalability of your individual connections to Amazon Connect. Networking considerations – TCP Port 443 and UDP port 3478 are used to support the Contact Control Panel (CCP) application running in the agent browser. Work with your networking team to allow these ports, and to decrease or eliminate the amount of filtering done to traffic coming from the agent’s CCP to the chosen Amazon Connect Region. It is possible to retrieve the current list of Amazon Connect IP targets in JSON form by using a basic script and updating your firewall every 30 days. Workstation requirements – It is important to match the minimum workstation specifications for good CCP performance. You can deploy the CCP on a VDI desktop for your agents, but make sure to test for network and audio problems induced by that type of configuration. It’s possible to split the CCP functionality by using the Amazon Connect Streams API that is documented on GitHub to work around performance problems with VDI deployment. Amazon Connect supports a broad and growing number of integrations with CRM providers, workforce and organization management software, outbound dialers, fraud detection, etc. Some of these integrations are available from AWS or partners as solutions that deploy rapidly for testing. For example, you can make the Amazon Connect agent interface (CCP) appear to be part of your CRM system by using the Amazon Connect Streams API (Streams), further simplifying the agent experience. Because Amazon Connect is an AWS service that is inherently API-driven, you can use other AWS services and AWS Lambda to pull together all the elements of a custom solution with reasonably uncomplicated software development and networking connections. The following diagram shows integrations with workforce management and customer relationship management SaaS platforms, and the use of AWS Lambda for customer database lookups. If you are planning to use chatbots implemented in Amazon Lex or need to integrate with an Amazon Connect Workflow Management partner, consider scheduling that work toward the end of the migration project. By that time, you have more efficiency with managing Amazon Connect. When preparing your call centers for production, review your AWS service limits from start to finish (Amazon Connect, AWS Lambda, Amazon DynamoDB, etc.) and ensure that they match your planned call and transaction volumes. You can work with AWS Support to review and increase these service limits as needed. Be sure to validate your revised service limits with performance testing before production release. You might have a contact center location or staff that is distant from the Amazon Connect Region that you have chosen. For example, your staff is in India, and your Region is in US East (N. Virginia). In this case, you may be concerned about latency and jitter problems between the agent’s Contact Control Panel (CCP) running in their local browser that might effect call quality. The troubleshooting documentation can be helpful in identifying root cause of latency or poor call quality. What’s next after migrating the contact center? With the migration process fully underway, it may be time to think more about changing your current workflows, physical plant, deployment of people, and team sizes. Prepare a vision for the organization’s desired future state. Then, take the time to communicate it to management and other constituent groups in your company. 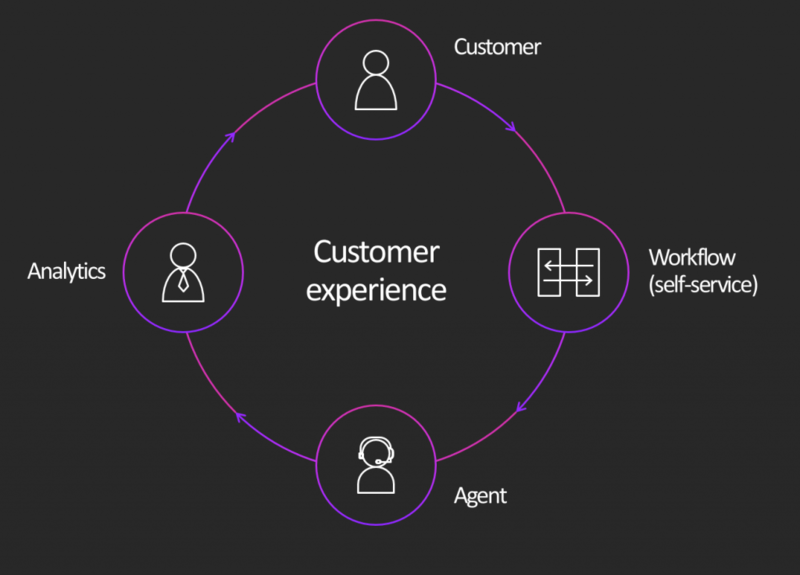 It may be possible to dramatically change the impact that your contact center transformation has on your company’s typical customer experience. You can use the interaction information that you are now able to collect from Amazon Connect, to consider other ways to interact with customers, and solve their problems before they need to call the contact center. As your experience with Amazon Connect grows, you can benefit from using analytics to better understand and drive greater customer self-service. In turn, this can increase customer satisfaction and lower talk time and related costs. Your AWS account team or Amazon Connect partner can show you ways to use the Amazon Connect call information to drive new service capabilities, such as Speech-to-Text-to-Sentiment analysis. You can use machine learning techniques to interact with callers to provide service without a human in the loop. If your contact center’s performance is regulated by a set of external constituents or by governmental authorities, consider educating these organizations on the capabilities of the Amazon Connect service and AWS. Work together to use Amazon Connect features to comply with regulatory requirements at lower cost, while providing a better customer experience. To stay up-to-date, add the relevant AWS RSS feeds—add the AWS What’s New blog and the AWS Contact Center blog—to your feed reader of choice. This helps to keep you current as AWS releases new features for the AWS services that Amazon Connect consumes. Keep in touch with your AWS account team to understand the Amazon Connect roadmap. There are many “build or wait” decisions to be made with Amazon Connect features. You also want to communicate what’s next to your internal and external customers. In this post, we’ve described best practices for planning and implementing a migration from legacy contact center infrastructure to Amazon Connect, and important organizational and integration considerations during the process. After reading this post, we hope that you feel both challenged and energized to start a process of contact center transformation. We look forward to your feedback.